I would like to invite you for next edition of the infamous one-day-only-exhibitions at Bibliothekswohnung on Saturday, 22nd of September from 14:00 to 18:00 hrs. On view will be works by Agan Harahap, Eliza Douglas, and Jim Allen Abel. The show is conceived by this notorious guy named Haysinger. Some of you may have heard of him or are even following him on Instagram (@haysinger). I guess it all started with a transfer in Helsinki on a flight to Indonesia in March 2017. I don’t know what exactly happened, but it seems that Haysinger disappeared on his way through the airport Helsinki-Vantaa. Anyhow, from that moment on he started posting pictures from Finland – even palm trees and white beaches, and I have to admit that I do not know Finland well enough to tell you where exactly he found them in Suomi. But he later also posted pictures of a performance by Korakrit Arunanondchai and Boychild, and I can tell you for sure that exactly one year ago this performance actually happened in Helsinki. 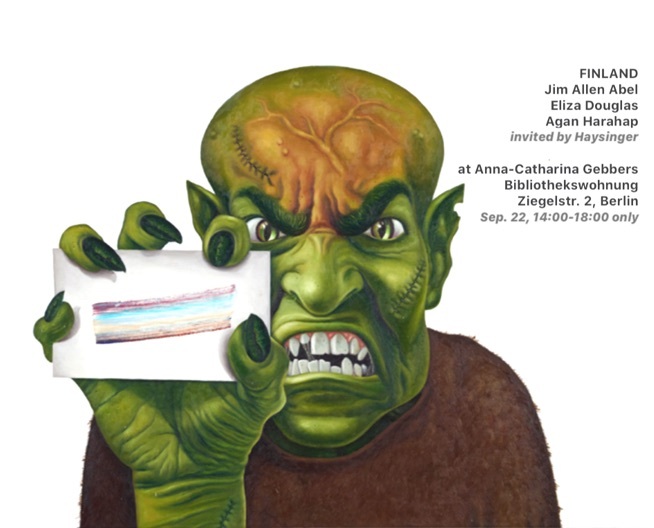 However, I don’t know how, but this September he managed to arrange an exhibition with works by Agan Harahap, Eliza Douglas, and Jim Allen Abel at Bibliothekswohnung in Berlin. Not sure if he’s there or not, but I’d like you to join me there this Saturday (22 September 2018, 14:00–18:00 hrs) to enjoy the works, and maybe to discuss whether the pieces have anything to do with Haysinger’s story or what we would like to think of his fate. Ich möchte Sie/Euch gerne zur nächsten Ausgabe der berüchtigten Ein-Tages-Ausstellungen in der Bibliothekswohnung am Samstag, 22. September von 14:00 bis 18:00 Uhr einladen. Zu sehen sind Arbeiten von Agan Harahap, Eliza Douglas und Jim Allen Abel. Die Ausstellung wurde von diesem Kerl namens Haysinger konzipiert. Einige von Ihnen/Euch haben vielleicht von ihm gehört oder folgen ihm sogar auf Instagram (@haysinger). Ich schätze, alles begann mit einem Transfer in Helsinki auf einem Flug nach Indonesien im März 2017. Ich weiß nicht, was genau passiert ist, aber es scheint, dass Haysinger auf seinem Weg durch den Flughafen Helsinki-Vantaa verschwunden ist. Von diesem Moment an hat er jedenfalls angefangen, Bilder aus Finnland zu posten - sogar Palmen und weiße Strände, und ich muss zugeben, dass ich Finnland nicht gut genug kenne, um Ihnen/Euch zu sagen, wo genau er sie in Suomi gefunden hat. Aber er hat später auch Bilder von einer Performance von Korakrit Arunanondchai und Boychild geposted, und ich kann Ihnen/Euch mit Sicherheit sagen, dass diese Performance vor genau einem Jahr tatsächlich in Helsinki stattgefunden hat. Ich kann zwar auch nicht erklären wie, aber nun ist es ihm gelungen, in diesem September eine Ausstellung mit Werken von Agan Harahap, Eliza Douglas und Jim Allen Abel in der Bibliothekswohnung in Berlin zu arrangieren. Ich bin mir nicht sicher, ob er dann da sein wird oder nicht, aber ich würde mich freuen, wenn Du/Sie mich dort an diesem Samstag (22. September 2018, 14: 00-18: 00 Uhr) besuchen würdest/würden, um die Werke zu sehen und vielleicht mit mir darüber zu diskutieren, ob sie etwas mit Haysingers Geschichte zu tun haben oder mit dem, was wir für sein Schicksal halten möchten. Agan Harahap (@aganharahap), born 1980 in Jakarta, Java, based in Yogyakarta, Java, Indonesia, began his career as a painter and illustrator when he was a graphic design student at Design and Art College in Bandung. He worked in the Tarzan Photographic Studio, Jakarta as a digital imaging artist manipulating photographs. He was a finalist for the Indonesian Art Award in 2008, and his first solo exhibition was with MES 56 in Yogyakarta a year later. A full-time artist since September 2011, his works have been exhibited in Korea, Japan, Portugal, Germany, Australia and Southeast Asia. Eliza Douglas (@elizad0uglas), born 1984 in New York City, NY, USA, based in Berlin, Berlin and Frankfurt, Hesse, Germany, studied Art at Staedelschule Frankfurt. She is a painter, singer, conceptual artist, performer and model. Her works were exhibited in France, USA, Italy, Germany, Norway, China and Monaco. She is leading performer and co-author with the performative work of her partner Anne Imhof, shown in Hamburger Bahnhof, Berlin and at the Venice Bienial 2017, where they won the Golden Lion for Best Pavillion. Eliza is also working as a model for Balenciaga and for various fashion magazines. Jim Allen Abel (@jimallenabel), born 1975 in Makassar, Sulawesi, based in Yogyakarta, Java, Indonesis, studied photography at Institute of Arts Yogyakarta. After graduating he went on to work as a photographer for some national top music bands, touring extensively throughout the country. Since leaving commercial photography work, he first advanced to photography art, presented in various exhibitions in France, Scotland, Australia, South East Asia, Korea, Japan and Liechtenstein. In recent years he is advancing to visionary installations. Jim is an active member of Mes56, an artist collective which focuses on the critical exploration of contemporary photographic and video art practices.